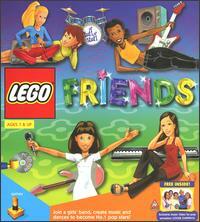 LEGO Friends is a music-oriented adventure that involves creating songs, dance steps, and even scrapbooks. Targeted specifically toward girls, the game stars a female teenager trying to help her all-girl band "Tuff Stuff" prepare for the school's big music show. Activities include talking to friends on a cell phone, snapping photos, and participating in themed mini-games. Players can hang out with the girl group in four different locales, including a bedroom, café, auditorium, and basement. Also featured on the CD-ROM is an interview and music video of the female band "Loose Chippin's".